Lately, I received many messages from investors 4d, how to win 4d, with the crack barcode on the ticket. I was not really a specialist in barcode crack but I will provide some tips based on my own experience and I hope you can make it as a reference. Before that, I want to ask you, do you believe that someone can win 4d, with the only break in the ticket barcode 4d? 4d has its own secrets and their management gives some tips via barcode on the ticket as interesting player to bet. I say this because according to our experience and the experiences of friends who play 4d by just reading the code on the ticket. Through my research on the internet, some people in Malaysia are able to read the code and 4d ticket, this individual gain tens of thousands a month and sometimes gain up to more than a hundred thousand. At first, I do not believe this individual may earn a profit of it, but when he showed his win tickets and the way he plays, I believe he is the king of 4d in Malaysia. Who are these people and how he plays 4d? 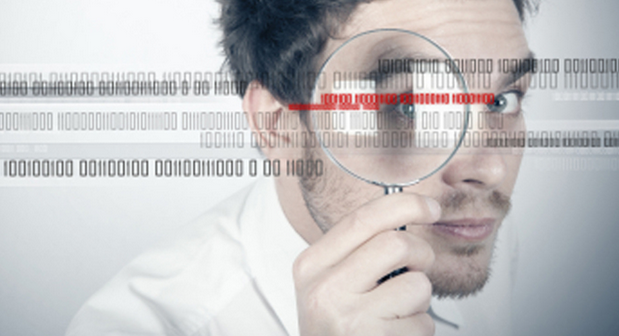 I keep secret the identity of the person on the basis of their privacy and security. How he plays 4d? He bought the lucky ticket (lucky pick) of RM1 each ticket, up to a total of 1000 tickets only to read the code and will make a bet with a huge amount. Unbelievable but that's the way he played in the 4d. If you do not understand how to read the code, do not ever use this method because you will have lost large amounts of money without winning any prizes. Well, if you are interested in playing 4d by reading the code, I will give you some tips for your reference and first of all, buy tickets 4d RM1 and make sure you buy your tickets at the counter of the same and do not change the counter because every counter has diffrent code. So you see every place, every counter has a different code. 4d game, you actually play around with how you feel and make sure you believe in yourself and do not be too according to your mood. Play based on logic, experience, mathematical calculations and do not stray facts with your goals. Believe it is a code that you believe and do not believe the code is not the same with your beliefs. Image above is an example 4d ticket to be used as a learning process. Number 1, is the number of bets and you should keep the number of odd and even numbers on all four of these numbers. 2, is a bar code that should be read and you should pay attention because often clue will appear in the position of this barcode. 4d clue will appear in position number 2 and number must be identical with the number 4d ranked number 1. Please see the above images as an example, the number 64 in number 2 is a suit with number 64 in number 1, this means, indicated clue is only 2D only. Clue that will hit in the next draw is number 64. 2d only clue in this ticket and you must find the combination of these numbers to make the number 4d. For your understanding, see example image below (Draw 19/08/2015). 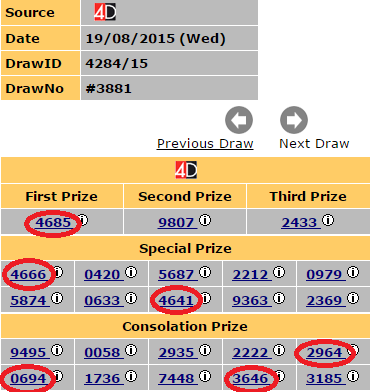 You will see the number 64 was hit in the draw date 08/19/2015. If the bar code number is equal to the number 2 ranked number 1, you must be careful with these numbers because most likely these numbers will hit on a draw. Even so, to make sure it's really going to hit, do a calculation of the percentage of 4d. Number 3, this position is difficult to interpret but if you carefully read the bar code, if the code number 3 and number 5 position is similar, for example the code position number 3 is 0480 and the code position number 5 is 0480, which means numbers in your ticket will be hit in a number one, two or three. Even so, this code is difficult to obtain. 4 numbers, this position is reading the code refers to the number you bet. Sometimes, the numbers in the same position with the number you bet 3d but often only to be hit. 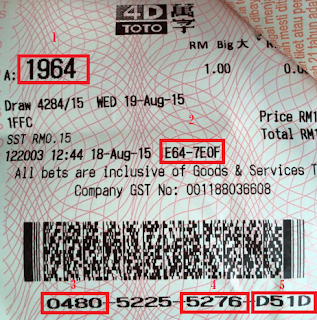 For example, refers to drawings tickets (Toto ticket) above, the 1964 numbers are the same in the barcode at position number 4, 1964. The number of combinations you have to find a way to 4d percentage calculations because, usually, it will be 3d numbers. Number 4, barcode position is particularly plays a big role in your betting. You can know the number of your bet will hit or otherwise. In this position you must hold a guideline of code F, A, B, C, and D, if the code as 527F, 527, 276, C276, 5D76, betting numbers will hit only 3D only during the draw. Even so, this code may vary in your area. To be proficient in this game, you can not expect to fully barcode reading. You must be proficient in basic math and decide wisely odd numbers and even numbers to be used as a combination of reading the code. This is because the basic game 4d are odd numbers and even numbers. My advice, you must be careful with this play, give full attention by calculating math facts, prepare your mind and you must know the risks of defeat. 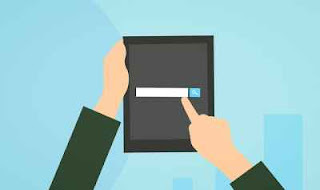 Make this article as a guide only and should not rely solely on this guide for your bet as bar code in your area may not match the bar code in my area. The most important thing is, the money you bet, do not follow your heart because this is the most difficult game because we try to discover the source code based on our understanding.